Welcome to the world of Vera Wang Look—an invisible accessory that expresses absolute originality. This modern luxury is the signature scent to set a woman apart. A sparkling elixir of mandarin and watery greens, layered with lush notes of lychee and golden delicious apple, creates an opening burst of sheer energy. The essence develops as a vibrant floral bouquet of lily, freesia, and jasmine blooms with feminine elegance. The indefinable expression of style is complete as it reveals deep basenotes that seduce with a blend that is at once complex and transparent. 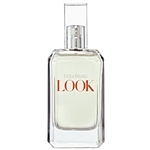 Notes: Mandarin, Greens, Lychee, Golden Delicious Apple, Lily, Freesia, Jasmine, Vanilla, Skin Musk, Oakmoss, Patchouli.